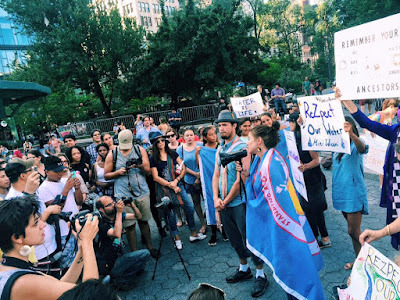 The Native youth runners from Standing Rock in North Dakota protested in front of the White House on Saturday, and then protested at Union Square in New York City, as they battled the Dakota Access Pipeline now threatening the Missouri River. The Native runners ran 1,500 miles to Washington with the messages, "Protect sacred water," and "You can't drink oil." They captured news headlines across across the country, including Democracy Now and People magazine. In New York City, the Native youth runners were joined by Josh Fox (Gasland, Gasland II, How to Let Go of The World And Love All The Things Climate Change Can’t Change), Shailene Woodley (The Descendants, Divergent), and Rosario Dawson. 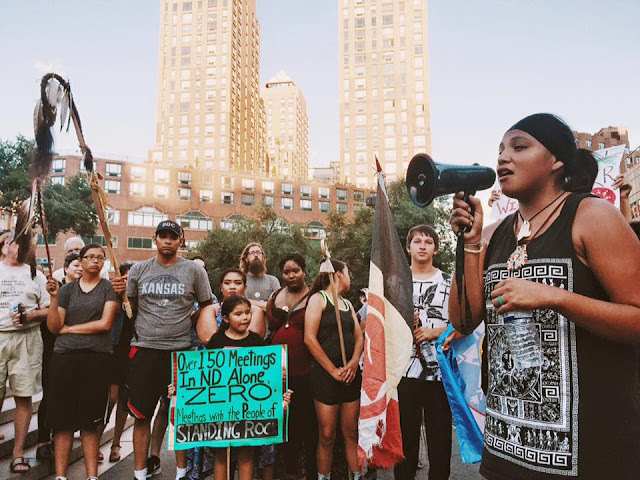 The Youth of Standing Rock Indian Nation ran 1,500 miles from North Dakota to Washington, D.C. to protect their water from the Dakota Access Pipeline, a crude oil pipeline being built on their river. They arrived in Washington, D.C. on Saturday, August 6, the runners said in a statement from New York City. 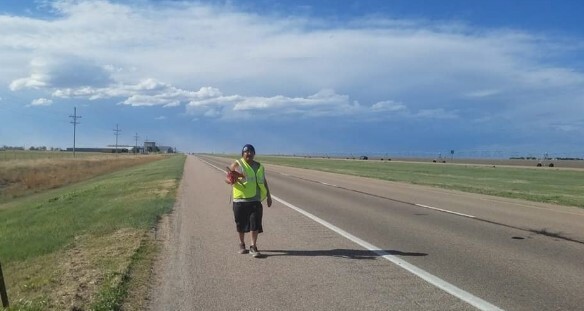 "The Standing Rock Reservation Youth finished the run from North Dakota to Washington D.C in protection for the waters. The proposed Dakota Access Pipeline has just been recently approved by the U.S. Army Corps of Engineers who are already starting construction in the Dakotas. The runners peacefully demonstrated their opposition, their message is not that it’s not a matter of if the pipeline breaks, but WHEN the pipeline breaks. 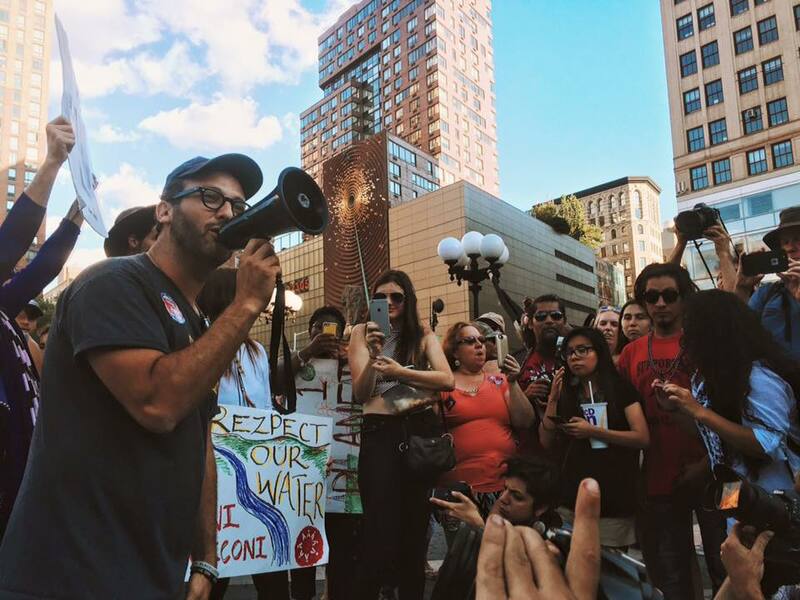 They hand delivered a petition with 140,000 signatures saying no to the Dakota Access Pipeline." Back home in Cannonball, North Dakota, Dakota, Lakota and other Native Americans at the Sacred Stone camp are prepared. Joye Braun, Cheyenne River Lakota, said, "Dakota Access has issued a 48 hour work order that was received by Standing Rock." 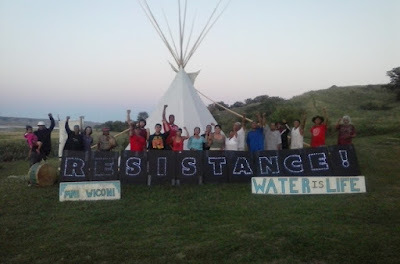 "The Camp of the Sacred Stones is a peaceful camp in prayer to stop the pipeline from destroying sacred water, eagle nesting sites, buffalo grazing, medicinal plants, and to protect the water intake for Standing Rock and the people along the Missouri river. "We absolutely do not believe in violence," Braun told Censored News. Braun was among those protesting at the North Dakota Capitol last week to bring awareness that oil is bankrupting our future. "The North Dakota legislature was trying to fix a budget shortfall that was caused by giving tax breaks and a blank check to the oil industry." 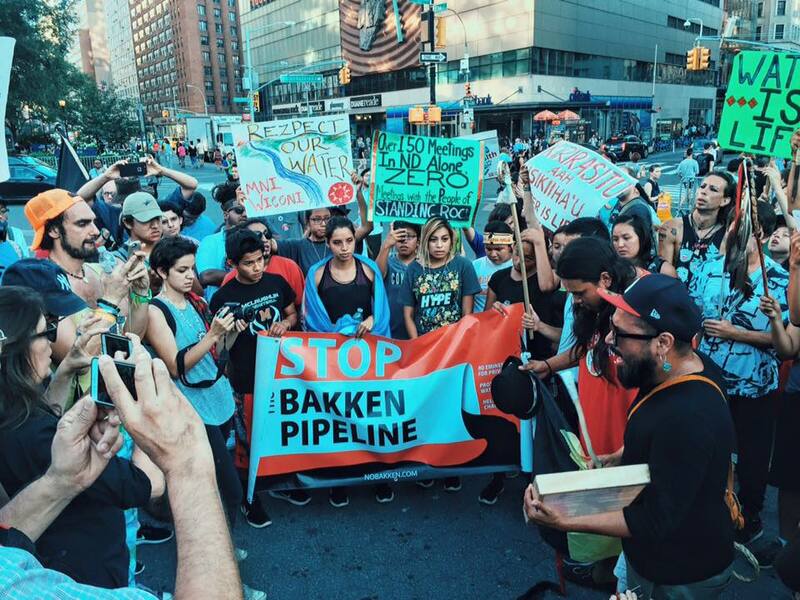 "Projects like Dakota Access pipeline and continued fracking are not helping the state but harming it." A new pipeline deal is now taking over where the Keystone XL pipeline failed. This new corporate scheme is to transport large amounts of dirty crude oil from North Dakota to the Gulf Coast. July 26, 2016 - the Army Corps issued the permit to cross Lake Oahe. July 27, 2016 - the Standing Rock Sioux Tribe filed its complaint, opposing the permit. August 4, 2016 - the Standing Rock Sioux Tribe filed its Motion for a Preliminary Injunction. August 8, 2016 - the Army Corps. provides 48 hour Pre-Construction Notification for PCN 4, the Lake Oahe Crossing. August 8, 2016 - the Standing Rock Sioux Tribe participates in scheduling conference with presiding Judge. August 18, 2016 - brief deadline for parties opposing Motion for Preliminary Injunction. August 22, 2016 - reply brief deadline for parties supporting Standing Rock Sioux Tribe's Motion for Preliminary Injunction. August 24, 2016 - oral argument on motion in Federal District Court for the District of Columbia. CALGARY – Despite U.S. President Barack Obama’s rejection of the Keystone XL pipeline, new barrels of Canadian crude oil will soon make their way to the U.S. Gulf Coast following a US$2.6-billion deal led by Enbridge Inc. to buy a U.S. pipeline system. Enbridge, the largest pipeline company in Canada, is teaming up with U.S. refiner Marathon Petroleum Corp. to buy a 49 per cent stake in two pipelines, the Dakota Access Pipeline and the Energy Transfer Crude Oil Pipeline, to provide a new route from North Dakota to refineries in Louisiana and Texas. Canadian oil producers have been pushing for more access to Gulf Coast refineries for years, but had their biggest hopes dashed in 2015 when Obama rejected TransCanada Corp.’s application to build the 890,000-barrel-per-day Keystone XL pipeline. This week’s deal by Enbridge, however, will allow more Canadian crude and oilsands barrels to flow to those Gulf Coast refineries. Visit for more information and to sign the ongoing petition.